This week's work in progress has been all about the Half Rectangle Quilt Block and very much inspired by the work of painter and drawing artist Carrie Marill (in particular the painting De Colores which you can see pinned here, and click through to Carrie's website for more of her works). 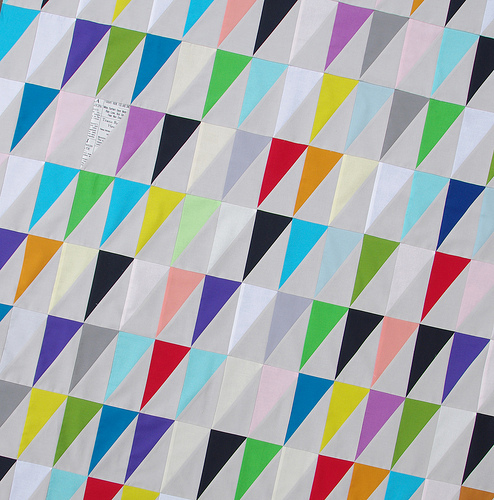 The Half Rectangle quilt block is not difficult to piece, particularly if you have on hand a nifty tool that comes with instructions to make blocks in 14 different sizes as well as cutting, sewing and trimming instructions. 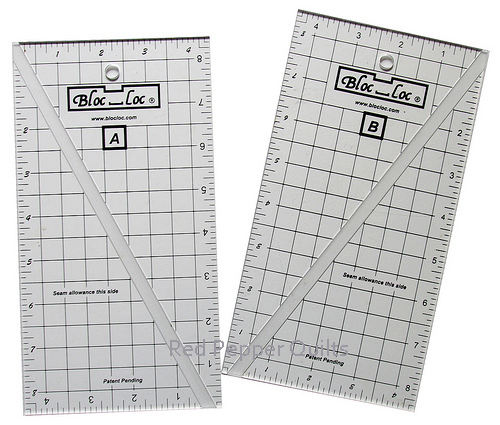 The Bloc Loc Half Rectangle Rulers are perfect for the job and come in a mirror image set of two rulers. Again the instructions involve slightly over-sizing the block, then trimming to exact size using these rulers; with the diagonal channel hugging the seam allowance which makes for quick/accurate ruler placement. Over-sizing and trimming units is often my preferred sewing method so these rulers really suit my needs. I absolutely love using these rulers and am excited to see that all Bloc Loc Rulers are now available from the Fat Quarter Shop! The fabrics used are all Robert Kaufman Kona Cottons including several of the new 2013 Kona Colors. The background (grey) fabric is Kona Ash. My finished half-rectangle blocks measure 3 inches x 6 inches. I can't wait to start quilting - I think the quilting will transform this quilt and give it dimension and texture. It's so striking! Can't wait to see it done! never a day goes by without learning something new from blogs I follow, today it is the half rectangle, love the effect it has and yes another template to add to my want list or should it be my need list.Your colours look glorious. Love this! I love the modern design and again your use of color is awesome! Can't wait to see it quilted! 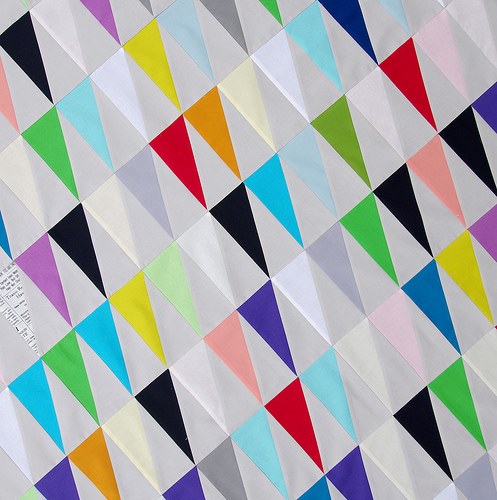 Bunting; that's what this quilt makes me think of. Because the triangles are angled slightly as half rectangles, the eye sees them as affected by perspective. Very cool. It makes the quilt seem like a festival or celebration. Something big and exciting and wonderful. I hope it represents wonderful news and great health for you. Hey Rita, that looks gorgeous! I love the touch you have given the top with the two text prints - Modern, inspiring, creative! It is gorgeous already! Love these colours, they brighten up any day! Simple, but dramatic! I can't wait to see the finished quilt! This looks stunning, your colour choices are wonderful as always! This is stunning! 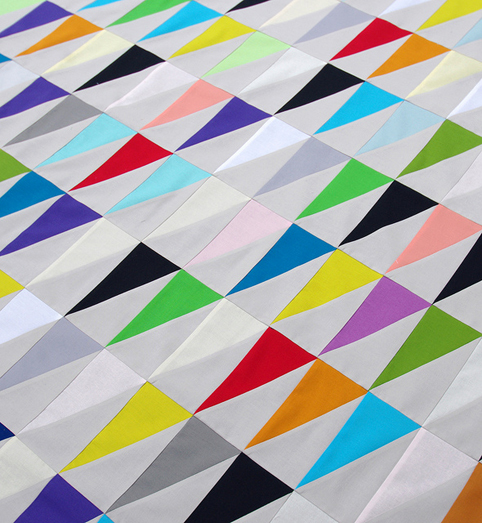 Your fabrics are so bright and fresh and your piecing is superb! Those rulers really work! Drat. My Fat Quarter Shop fabric order just arrived. I never thought to look for the rulers. Next time! This is beautiful and fresh. I love the little text print stuck in there and so happy to see Ash...I just ordered some and can't wait to see it. 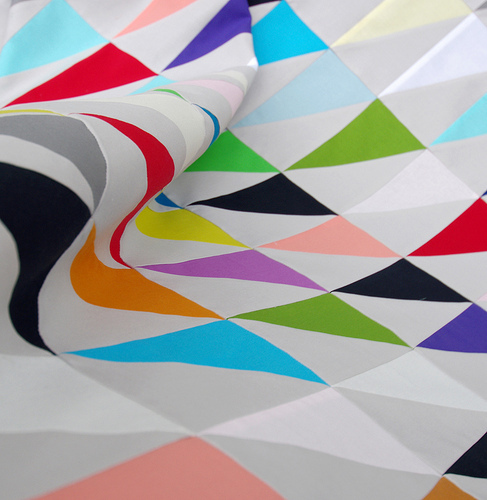 That´s such a happy quilt top, gorgeous! Love my Bloc Loc Square Up & Flying Geese Rulers, did not know they had Half Rectangle Bloc Locs... guess where I am headed. Fat Quarter Shop! Thank you for the heads up. Beautiful! You've really captured the feeling of the inspiration pin, but I love the extra bright colours and the cool grey background. Can't wait to see how you quilt it. 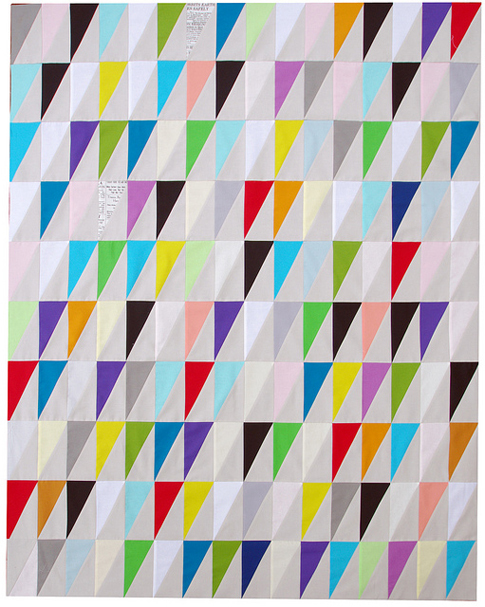 Your Half Rectangle quilt looks really good! It's such a happy looking quilt! It already looks fantastic from here. But, I'll look forward to seeing what you do with the quilting! I cannot wait to see this all quilted up! It is already gorgeous! The half rectangles alone are amazing, but the vibrant colors are so striking! What an amazing quilt! Rita, this is SO pretty. I just love the texty triangles. Stunning! I love the restraint you showed with keeping it mostly solid-- those bits of text shine even more! I've got that template on my list now..... Thanks! I can't wait to see how you quilt it. It's beautiful! I've been using my bloc loc ruler for a scrappy quilt in graduating colors. It changes every day as it gets better and bigger ! Love these rulers ! I love the way you use white as a colour in this quilt. It is a fabulous quilt!